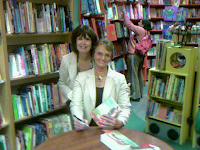 Book signing at Torbay Bookshop in Paignton with friend Ann. It turned into a mini party as so many people came to support it. 1) A woman came to buy a copy of The Russian Concubine because she'd heard me on Palm Radio the day before talking about my mother's White Russian history. It turned out that this woman's own White Russian grandparents had also suffered tragically at the hands of the Bolsheviks. A deeply touching story that stays with me. 2) Another woman arrived to buy the book because she has the same surname - Furnivall. Not a common name. So we're going to compare notes and see if our families are connected somewhere along the line. A new cousin? Many thanks to all those who came to the book signing to support The Russian Concubine. It made it special.